Sinae Joy Cheh is the Artistic Director of Morning Star Korean Cultural Center in Lynnwood Wash., where she teaches Korean dance, music and heritage to those interested in sharing Korean culture. Since its founding, Morning Star has continued to expand and diversify its repertoire, programs and service to the community. Morning Star has been featured at more than 1,500 events domestically and all over the world. In addition, Morning Star is responsible for the production of Narae, a highly acclaimed cultural showcase held annually in November. Morning Star is committed to continually providing opportunities to those who want to experience Korean culture. 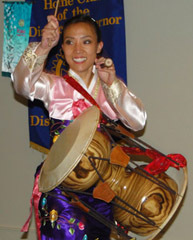 Sinae Joy Chec, Director of Mornigstar Korean Cultural Center, entertained the BBRC with a lively drum and dance solo and shared her heritage. John Schwager and the Newbies group presented the YMCA director with their district grant. Paul Osborn gave us a chance to help in the selection of a New Look for the Reveille. Kit Bowerman asked for more beer donations for the silent auction. Rourke O’Brien, a Rotarian who has perfect attendance for the 19 years he has been a member of Rotary , introduced our speaker. What followed was a lively drum and dance solo. Claiming that there is no graceful way to catch her breath after her beautiful performance she talked about Korean culture that existed before Korea was separated into north and south. Western rhythm is linear whereas Korean rhythm is more circular. It is hard to stand still when performing Korean music. She had the club clapping along to the pounding of her drums which, to the uneducated ear sounded a LOT like kindergarteners who are learning body control. Her instruments represent different elements of nature and the sound of rain is always present in Korean music. Her drum in called an hourglass drum since it is shaped like an hourglass. Sinae provided a short history of Korea through her music. Her elegant Han Bok added to the beauty of her dance and musical performance. Korea has a warring history and much of Korean music demonstrates the suffering of its people. Sinae brought out a 25 string instrument on which she played a traditional folk song. Frighteningly, Sinae encouraged the group to sing in the hoarse guttural Korean way by accessing our “energy source” which resides in a region not frequently discussed in mixed company. Always troupers, the club sang along, luring a massive herd of lustful-looking, grass-munching, rental goats to appear just outside the window. Yes, it was a GREAT meeting!! Jim Zidar provided the invocation with the prayer of St. Frances in honor of RI President Tanaka’s focus on peace through service. Dustin Walling welcomed guests. Fred Barkman brought a guest but didn’t bother to show up to introduce him so he did it himself. simplified grant. They looked at a large number of organizations to receive the grant and ultimately chose the Bellevue YMCA. The director of the Y was here to receive the grant which will help renovate a playground they affectionately call “Bosnia” because it’s so bad. The project will renovate the play area and make it a wonderful place for kids to play. Ruben LadLad , World Community Service Chair, Leader of the golf tournament and BBRC board member thanked the members of the golf team. He announced that we have 108 players and we could accommodate a few more. We’ve raised $25,000 in sponsorship money. Paul Osborn provided a tutorial on the work of the website committee, what they do and don’t do. He updated the club on the website work that has been done so far and what remains to be done. He showed the new design options and asked for everyone to respond to the survey of design options so that everyone’s voice is heard. He asked that all committee chairs provide content to make the website useful and interesting. Tim Johnstone didn’t show up for this SAA assignment and the prevailing theory is that he is still at the Rock Bottom where he was spotted holding down a seat for what was said to be a veeeerrrryy long time. Kit Bowerman asked everyone to bring a bottle of their favorite beer to fill up the wheelbarrow that will be part of the silent auction at the golf tournament. NO REGULAR MEETING NEXT FRIDAY DUE TO THE GOLF TOURNAMENT ON MONDAY!! Thought for the day: Chris shared the thought for the day ONLY with our presenter, Sinae, but said that we would all have to go to the website to see it for ourselves.